Soil moisture variations affect the evolution of weather and climate over continental regions. Initialization of numerical weather prediction and seasonal climate models with accurate soil moisture information enhances their prediction skills and extends their skillful lead times. Information about saturated soils and inundated wetlands can improve estimates of terrestrial methane (CH4) emission, which is the 3rd most important greenhouse gas after water vapor and carbon dioxide. Information about freeze and thaw is used to determine the distribution of frozen ground to improve the assessment of land surface conditions in global forecasting systems. Improved seasonal climate predictions will benefit climate-sensitive socioeconomic activities, including water management, agriculture, fire, flood, and drought hazards monitoring. Soil moisture strongly affects plant growth and hence agricultural productivity, especially during conditions of water shortage and drought. Currently, there is no global in situ network for soil moisture monitoring. Global estimates of soil moisture and plant water stress must be derived from models. These model predictions (and hence drought monitoring) can be greatly enhanced through assimilation of space-based soil moisture observations. Improvements in the ability to monitor and forecast agricultural drought (i.e., the lack of root-zone soil moisture) will improve famine early warning in the most food-insecure countries in the world. Soil moisture information can be used to predict wildfires, determine prescribed burning conditions, and estimate smoldering combustion potential of organic soils. Improvements in wildfire information with SMAP soil moisture products can provide more useful and accurate data on toxic air-quality events and smoke white-outs (thus increasing transportation safety) and can inform prescribed fire activities (increasing efficiency). Soil moisture is a key variable in water-related natural hazards including floods and landslides. High-resolution observations of soil moisture and landscape freeze/thaw status will lead to improved flood forecasts, especially for intermediate to large watersheds where most flood damage occurs. Surface soil moisture state is key to the partitioning of precipitation into infiltration and runoff, and thus is one of the major pieces of information which drives flood prediction modeling. Similarly, soil moisture in mountainous areas is one of the most important determinants of landslides. In cold land regions, the timing of thawing (which can be derived from satellite radar measurements) is coincident with the onset of seasonal snowmelt, soil thaw, and ice breakup on large rivers and lakes. Hydrologic forecast systems initialized with mapped high-resolution soil moisture and freeze/thaw fields will therefore open up new capabilities in operational flood forecasting and flash flood analysis. In turn, this will improve the response of government agencies and emergency managers to a full range of emergencies and disasters, and potentially provide insurance brokers with an up-to-date indicator of the likelihood of flooding, landslides, droughts, and wildfires in risk models related to business decisions. SMAP will provide information on water availability and environmental stress for estimating plant productivity and potential yield. The availability of direct observations of soil moisture status and the timing and extent of potential frost damage from SMAP will enable significant improvements in operational crop productivity and water stress information systems by providing realistic soil moisture and freeze/thaw observations as inputs for agricultural prediction models. Improved models will provide crucial information for decision-makers managing water and other resources, especially in data-sparse regions. Even without simulation models, farmers can also use soil moisture and freeze/thaw information directly as a proxy for field readiness (i.e., determining when the soil is dry enough for driving heavy machinery). At the global scale, a better grasp of the impact of agricultural drought on crop yield provides better crop supply and demand information for use by producers, commodity markets, traders, and policy makers. Forecasts of the impact of climate fluctuations on crop yields with on-going measurements of soil moisture and freeze-thaw will also improve management of agriculturally-important pests and disease in developing countries. Improved seasonal soil moisture forecasts using SMAP data will directly benefit famine early warning systems particularly in sub-Saharan Africa and South Asia, where hunger remains a major human health factor and the population harvests its food from rain-fed agriculture in highly monsoonal (seasonal) conditions. In the temperate and extra-tropical latitudes, freeze/thaw measurements from SMAP will benefit environmental risk models and early warning systems related to the potential expansion of many disease vectors that are constrained by the timing and duration of seasonal frozen temperatures. SMAP will also benefit the emerging field of landscape epidemiology (aimed at identifying and mapping vector habitats for human diseases such as malaria) where direct observations of soil moisture and freeze/thaw status can provide valuable information on vector population dynamics. Soil moisture in the upper layer has a direct effect on dust generation and air quality in desert and arid environments. Indirect benefits will also be realized as SMAP data will enable better weather forecasts that lead to improved predictions of heat stress and virus spreading rates. Better flood forecasts will lead to improved disaster preparation and response. Soil moisture provides more accurate information on the state of saturated soils that impacts stream flow, nutrient loading and turbidity; and these both lead to better management of urban water supply and quality. Information on surface soil moisture and freeze/thaw is critical to evaluating ground trafficability and mobility. The integration of soil moisture has been determined to be the single most critical parameter in state-of-the-ground models. Soil moisture and freeze/thaw data are also key to a broad array of military and civil works capabilities including road and bridge building, dam and levee assessment/construction, and tactical decision aid design and development. Weather models need maps of the soil moisture and freeze/thaw variables to initialize forecasts for low-level fog, aviation density altitude, and dust generation. 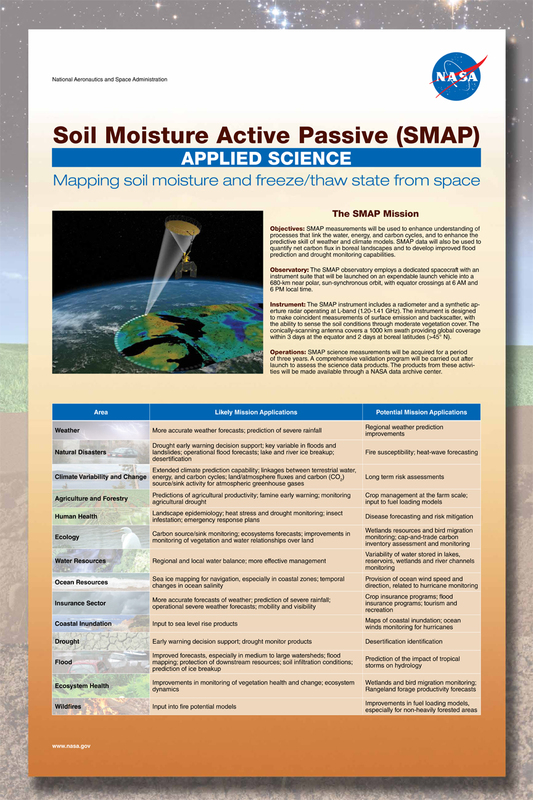 SMAP soil moisture and freeze/thaw information exceed current capability in terms of resolution, sensitivity, coverage, and sensing depth. Furthermore, radar observations over oceans and water bodies yield information on ice cover at high resolution and regardless of illumination. The SMAP Applications Program was initiated to integrate applications needs into mission planning as encouraged by the US Congress, the National Research Council, and the NASA Earth Science Division. Roles and responsibilities evolved as the Program developed and as needs became apparent. The SMAP Applications Program follows an Applications Plan that is updated continuously as the SMAP mission proceeds through its development and operational phases. National Research Council Decadal Survey Report “Earth Science and Applications from Space” Chapter 1 states “A fundamental challenge for the coming decade is to ensure that established societal needs help to guide scientific priorities more effectively and that emerging scientific knowledge is actively applied to obtain societal benefits. New observations and analyses … broadened community participation and improved means for dissemination and use of information are all required.” It further states that "...addressing the environmental challenges will not be possible without increased collaboration between Earth scientists and researchers in other disciplines including the social, behavioral, and economic sciences and policy experts. It is necessary now to build on the paradigm of Earth system science and strengthen its dual role of science and applications. This duality has always been an element of Earth science, but it must be leveraged more effectively than in the past..."
The SMAP Applications Program is a group effort with hundreds of partners ranging from users to NASA managers. The SMAP Applications Team is a smaller group that works closely to plan and prioritize SMAP applications activities. At the time of this writing, the SMAP Applications Team is comprised of the SMAP Applications Coordinators (Molly Brown and Vanessa Escobar), SMAP Applications Working Group Chair (Susan Moran), SMAP Science Definition Team Leader (Dara Entekhabi), SMAP Project Scientist (Simon Yueh / Eni Njoku), SMAP Deputy Project Scientist (Peggy O’Neill), SMAP Project Manager (Kent Kellogg), SMAP Science Data Systems Representative (Barry Weiss), NSIDC DAAC Deputy Manager (Amanda Leon), NASA Headquarters Applied Sciences Program Manager (Brad Doorn), and NASA Headquarters SMAP Program Scientist (Jared Entin). As stated earlier, the goal of the SMAP Applications Program is to engage SMAP end users and build broad support for SMAP applications through a transparent and inclusive process. Toward this goal, the SMAP mission formed an open-community SMAP Applications Working Group (AppWG) and held the 1st SMAP Applications Workshop on September 9-10, 2009. Presentations and discussions at that workshop provided the basis for development of the SMAP Applications Plan. The SMAP Applications Plan is a living document that is updated as the SMAP mission proceeds through its development and operational phases. It outlines the goals, strategic partners, implementation strategy, and evaluation plan for the SMAP Applications Program. After launch an update to the plan Operations Phase E SMAP Post-Launch Applications Activities was published in November 2015. Applications Workshops and Tutorials provides a list of SMAP applications workshops and tutorials. Meetings & Workshops provides a list of all SMAP meetings and workshops. Applications Working Group The SMAP Applications Working Group coordinates SMAP applications activities. The working group has developed a SMAP Applications Plan, conducts applications workshops and tutorials, and coordinates engagement of SMAP Applications Early Adopters.